Remember how the other day we combined two really awesome desserts to make one super amazing dessert? I’m talking about the S’mores Lava Cakes. Oh my gosh those were life changing. But I’m about to change your life again with this dessert. Just try to wrap your head around this… Cinnamon rolls + cheesecake. Sort of unbelievable right?? I know, I can’t believe it either. Except that I do believe it…. because I ate these. And eating is believing. Or something like that. I think I would like to eat cinnamon roll cheesecake things for the rest of my life please. 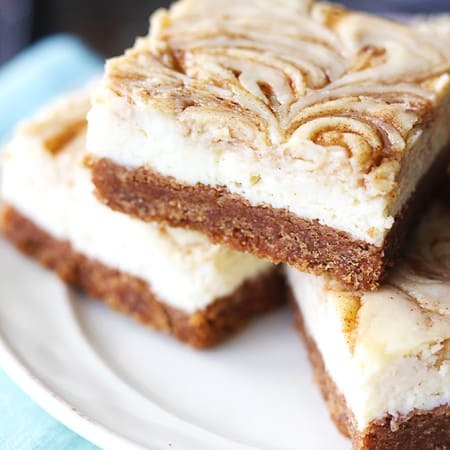 These Cinnamon Roll Cheesecake Bars are sooooo so so so SO good! Why have I not had these for the past 20+ years?? The sweet and salty, cinnamony graham cracker crust, plus the rich and creamy cinnamon roll swirled cheesecake equals my own personal heaven. These are a piece of cheesecake to make (ha!) and are so worth less than an hour of your life. Please make these, and then share them with me. I’m hooked! Go on try one, you’ll be hooked too, I guarantee it. 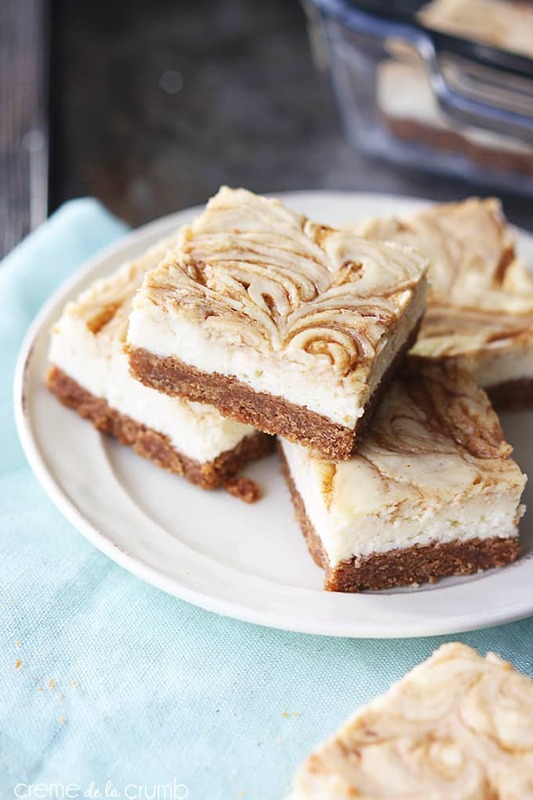 A cinnamon graham cracker crust topped with a creamy cinnamon roll cheesecake filling! Preheat oven to 350, line an 8x8 inch pan with foil and grease with cooking spray. Pulse graham crackers in your food processor until fine crumbs form. Add sugar and cinnamon and pulse. Add melted butter and continue to pulse another 30 seconds. Press mixture into prepared pan. Bake 5 minutes. Prepare cinnamon roll filling. In a small sauce pan combine butter, cinnamon, and brown sugar. Cook over medium heat and stir until butter is melted and ingredients are combined. Stir in vanilla and flour. In a large bowl whisk together egg and sugar until foamy. Add cream cheese and vanilla until smooth. Pour mixture on top of baked crust. 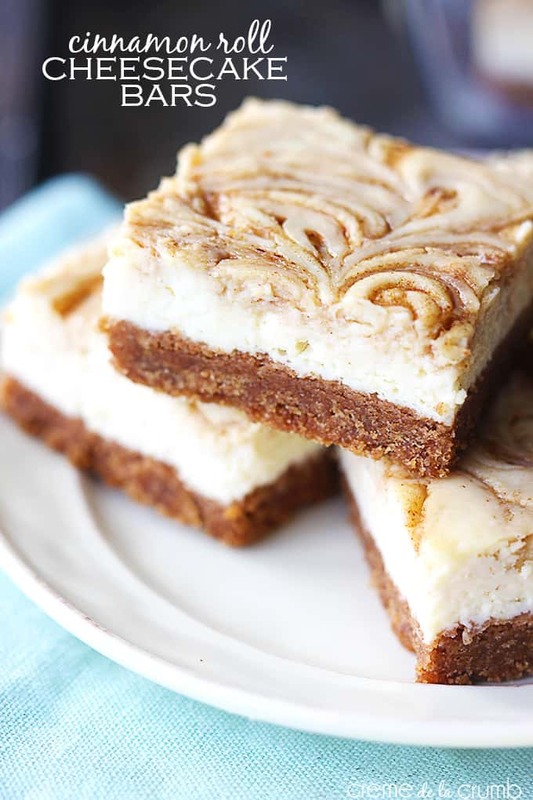 Drizzle cinnamon roll filling over cheesecake layer in any pattern you desire and use a toothpick to swirl into cheesecake layer. Bake 20 minutes or until cheesecake is set. Allow to cool 30 minutes, then continue cooling in the fridge. When completely cooled, cut and serve. Store in airtight container in fridge. Instead of using graham cracker “sheets”, I have a box of graham cracker crumbs in my cupboard. How much of that do you think it would be? I would think about one and half to two cups would do the trick! Tiffany! After stalking you on instagram, I finally decided to check your blog out. First of all, your pictures are gorgeous! And this recipe, well I am a true fan of cinnamon rolls and cheesecake so I can’t wait to try this one out. 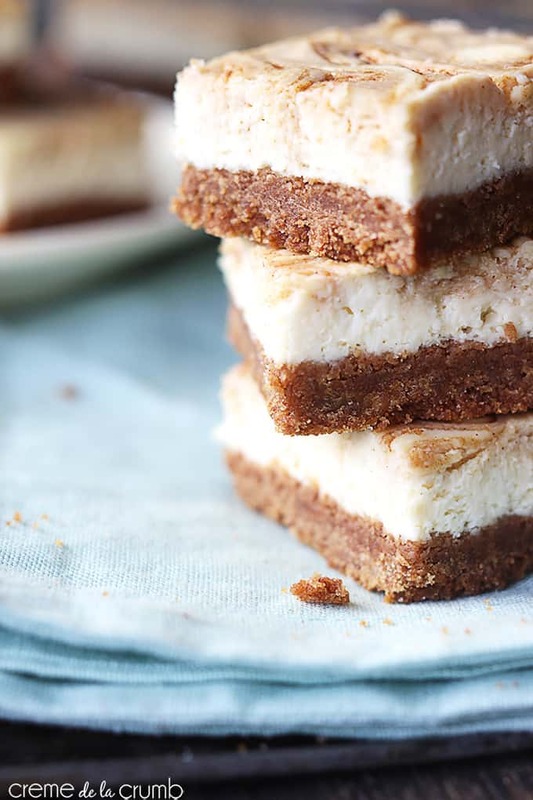 Plus cheesecake bars are so much better and easier than a true cheesecake. Love. These look so delightful. So glad I discovered your blog. Pinned and following on bloglovin. These look heavenly! Gorgeous photos! WOW – these look fantastic! I’m wishing I could reach into my computer monitor and grab one right now! PINNED! Haha! Oh thank you so much Martha!! S’more Lava Cakes?! I’m headed there now!!! Between this cheesecake and lava cakes… I might be in trouble… or well my pants might be in trouble LOL. I’m an avid baker and my husband raved that these we the best thing I’ve ever made! Question on the ingredients: list states one egg, instructions mention adding an egg twice. What’s the accurate egg count? sounds like there are 2 eggs involved [or in my case 4]. I’ve used 2, the proper number, and what i have is very very very thick, lumpy [i packed both the mixer and the food processor] and isn’t going to “pour” anywhere. am I missing an egg? or 2? In the oven now. Can’t wait. I made these last night and they are delicious. Perfect amount of crust and cheesecake! I’m living in Switzerland and it is so complicated to find graham crackers here… And really expansive! Could you tell me how much 12 sheets of Graham’s crackers are in grams ou cups ? So that I can buy an equivalent stuff :)! Hi Tiffany! Mine are sitting in the oven as I write and they look great! I have a couple questions for you–when making the cinnamon roll filling, when do you remove it from the heat? I took it off before adding the flour and vanilla, but when I put the filling on top of the cheesecake the texture was not consistent…a little was very liquid-y and less “drizzled” and more “dumped”! Also, it was a lot darker and thicker on the top than what’s shown in the pictures–any idea if I did something wrong?? Another question–for the cheesecake description, you list adding an egg twice but I only see one egg in the ingredient list…is it one or two? I used one and put it in with the sugar–I assumed that was more correct! Thanks for the great recipe! I can’t wait to try them. They smell awesome! My cinnamon roll filling also got lumpy and separated after removing from heat while I did next step of making cheesecake. I tried reheating but that didn’t help. I’m sure it will still taste delicious,but I think next time I will do the cinnamon roll filling step last so I can immediately pour over cheesecake layer before it thickens up and gets lumpy. Wow oh wow! These look absolutely amazing! Not only are they gorgeous to look out, I’ll bet they taste divine! Pinned! Hi Tiffany! If I wanted to double this recipe, would I just use a 9×13 pan instead? Do you know how long I would bake this size pan for? Why do you use foil on the bottom of the pan? Hi Heidi, Using foil for bars like these is one of my favorite tricks. It makes it so easy to just lift the entire batch of cheesecake bars right out of the pan and set it on a surface for cutting. When you make them without the foil, bars can 1) get chunks stuck to the pan and 2) when you try to shovel them out of the pan they can get destroyed or messy. When they’ve been lifted right out of the pan, you don’t have the pan’s edges in the way of cutting your bars and it’s so easy to clean up afterwards as well – no scrubbing the pan! Tiffany, just want you to know this is one of the tastiest, most unique bar recipes around. I regularly have people going crazy for this. Just wanted you to know I ALWAYS double the recipe and bake it in a 9 X 13. I usually start checking it after about 25 minutes. Just so that you all know, as a 9 X 13 is actually a smidge less than exactly double the size of the 8 X 8, there is much more topping than in your photo. But, with this, the more the merrier. Great recipe! I by chance have a GF graham cracker crust someone gave me, could I use that instead? I haven’t found a recipe for it that interested me? Or could I crumble it up and put it in an 8×8 and proceed as you wrote? These looked so Promising. Alas, I also ended up with gravel for cinnamon swirl – twice and then ran out if bUtter, so I sprinked thE Cheesecake with cInnamon and called it a day. Not sure what I did wrong. Ashley- I am so sorry to hear this didn’t work out for you! I am not quite sure what went wrong either. Hopefully the cinnamon on top worked out for you! Hello, the ingredients for the cheesecake layer. Call for one egg but the instructions call for two. WHICH is correct. Hi Jaci- my mistake! It is a typo in the wording. It is just one egg! Thanks for pointing that out! I’m moving, and my mixer is packed, so I’m mixing by hand[s]. I’m making the cream cheese part, and my mixture is very very very thick, lumpy, and is not going to “pour”. The recipe calls for 1 egg and says “whisk together egg and sugar until foamy. Add cream cheese, egg, and vanilla until smooth. pour…” I doubled the recipe, so that means 2 eggs, but i can’t imagine that makes a difference. am i short an egg or two? It was a typo that is now fixed. Thanks for pointing that out! It should only be one egg. i was making these last nite, and was very concerned about the issue Kelly raised, of the confusion on the number of eggs used. The requisite #of eggs. The cheesecake mixture was very thick. Also, I wish you’d put a note that the cinnamon topping should not be allowed to cool much before swirling it on. I had to reheat it, and it also was very thick and unattractive. tasted great, though! Made these and the family agrees they are good. My only comment is on the prep order. Next time I make them I’ll do the cinnamon roll topping last. After I made it, it set up while I was doing the cheesecake so it was hard to ‘drizzle and swirl’. Of course I’m a novice so I may have done something wrong. Thanks for your input, Mike!